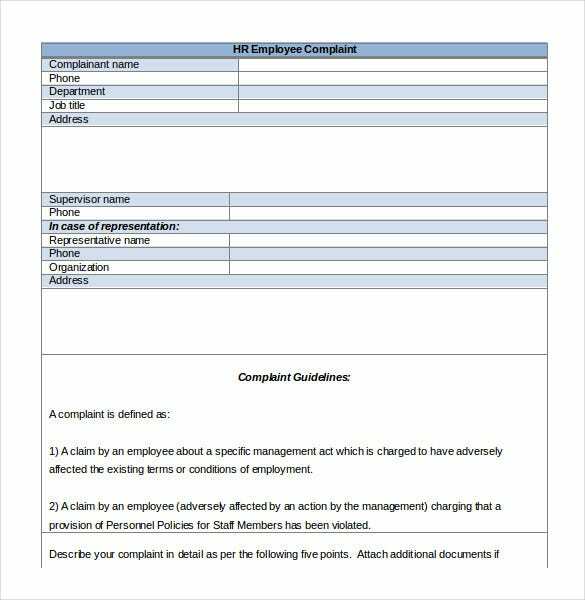 To write PDF complaint letter to the Human Resource department, use the HR complaint letter word and convert the letter into a PDF file before sending as an email attachment, digital copy in a flash drive or as hardcopy printout. The human resource department is always there for you; they will take notice of your issue and attend to it as soon as they can. 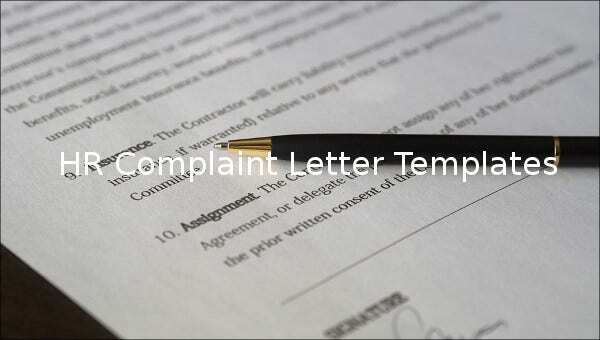 You can also visit Environment Complaint Letter. The letter must be formal. You need to make it short; it is a workplace letter, not a presidential speech. Try the best you can to highlight only the most important issues. Otherwise, the HR may not even respond to your complaints. 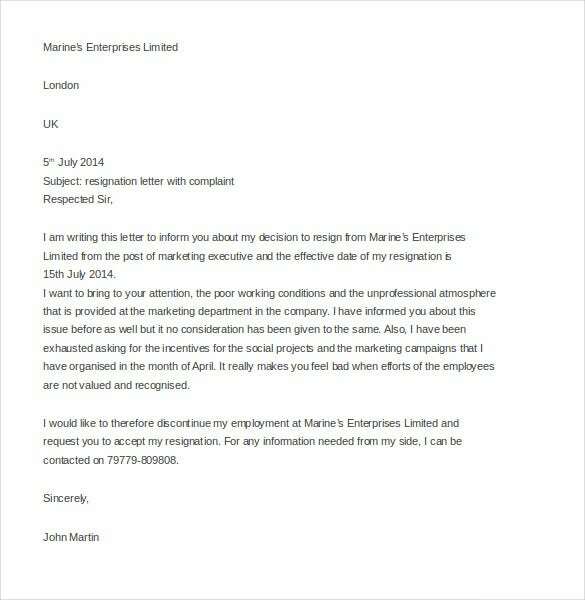 You may also Complaint Letter Templates. 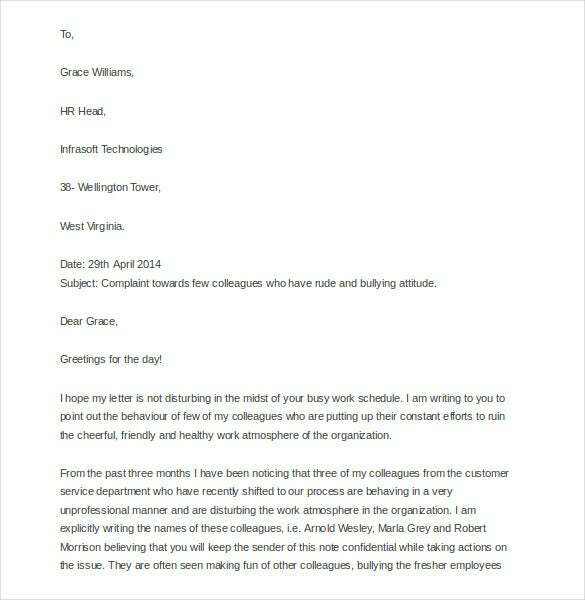 sampleletters.in | This HR complaint letter template is available in Word format, you can easily download it and fill the blank spaces, and it’s used by employees while raising complaints in a company. sampleletterz.com | This complaint letter is easy to download and available in Word format, it’s very important since it enables employees to alert the HR on irresponsible behavior by colleagues like bullying. 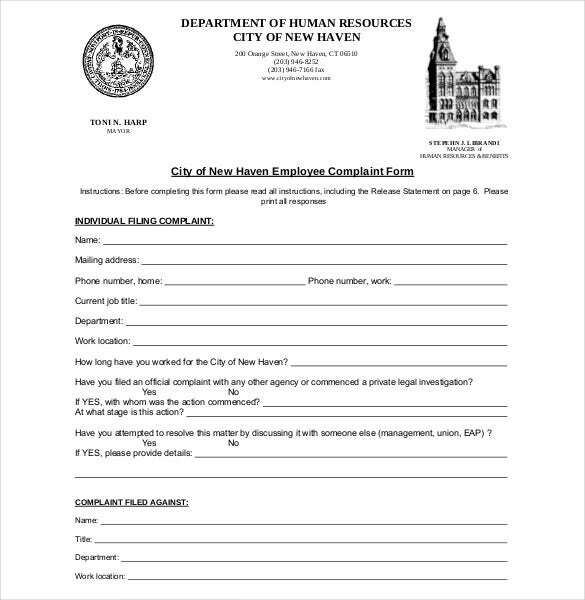 template.net | This human resources complaint is available in Excel format and is downloadable; it contains complaint guidelines and claims by an employee about specific acts that may affect conditions of employment. 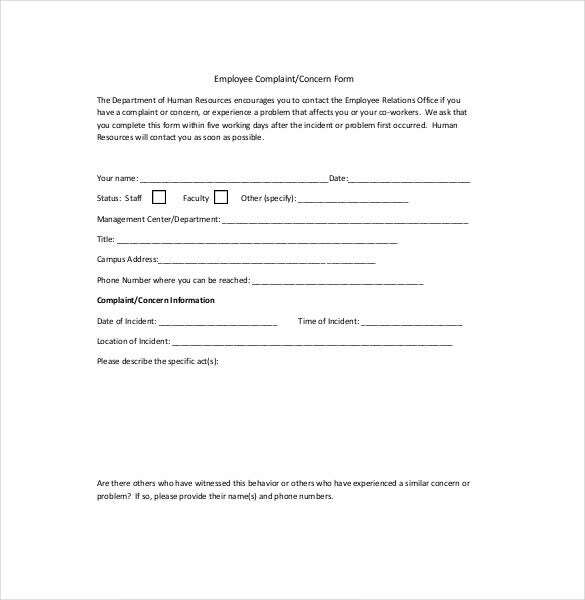 case.edu | This employee concern and complaint form is available in Word format; you can download it and fill the blank spaces. It’s used by employees to report problems that may affect them and their coworkers. 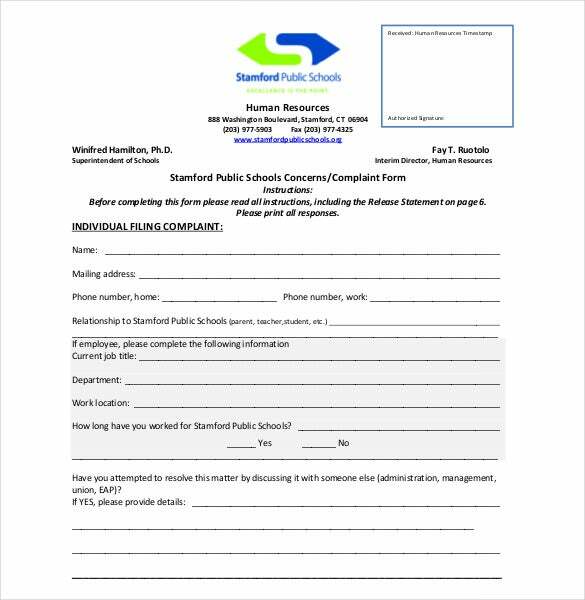 stamfordpublicschools.org | This employee complaint form template is downloadable in Word format; it is mainly used by employees to address the human resource managers on matters affecting them in the work place. 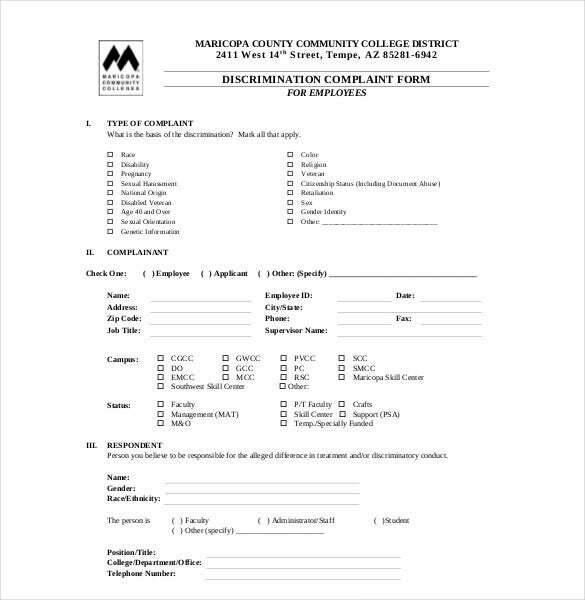 hr.maricopa.edu | This HR discrimination complaint form available in Word format is downloadable, it contains basis of discrimination, the details of complainant and the respondent believed to have committed a discriminatory conduct. 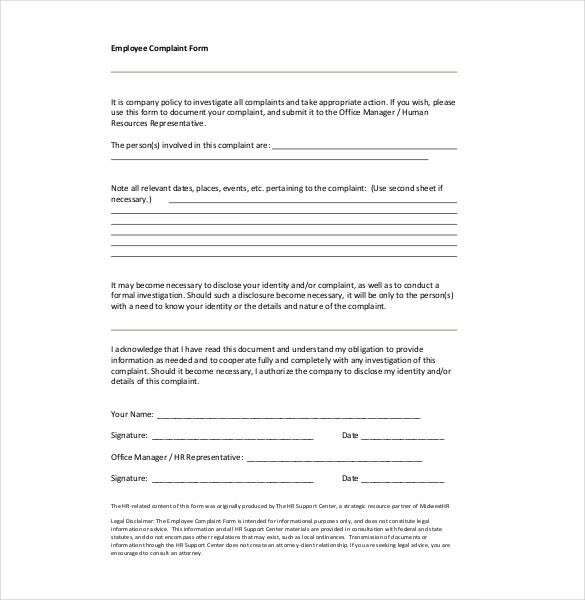 midwesthr.com | This employee harassment complaint form template comes in Word format, you can download it and fill the blank spaces, and it’s useful in conducting investigations on cases of harassment in the company. 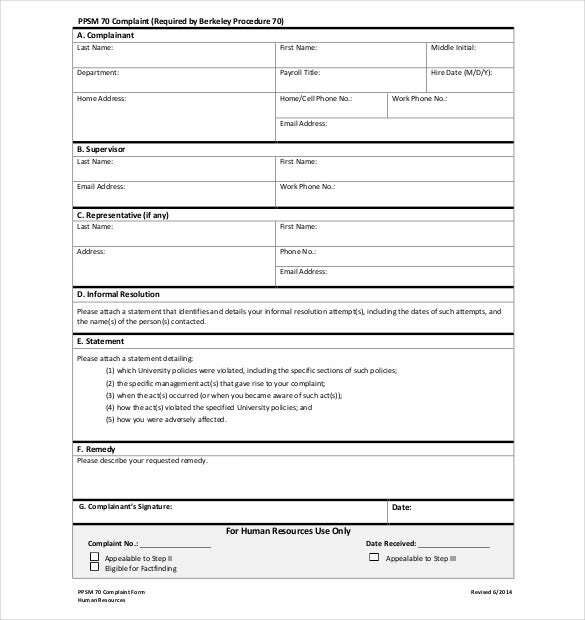 hrweb.berkeley.edu | This HR complaint template is a PDF format document, it contains details of the complainants, the supervisor and a representative, it also enables you to attach a statement showing how you were affected. sampleletterz.com | This HR complaint letter template is available in Word format, it contains various complaints like poor working conditions it can be used by employees who wish to resign from work.